Our larger research work focuses on the deployment of mobile banking in changing practices of social protection for forcibly displaced families in Colombia. 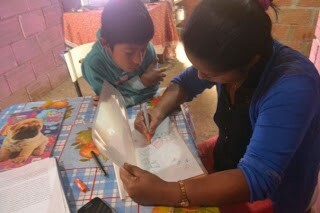 Part of our research entailed drawing family maps of our informants’ family practices of social protection. Methodologically, this involved two steps: First, we mapped members of the network and in the second step we mapped the different goods and services circulating within that network. The goods and services included not only money but also care, food, housing, etc. Here, we draw from our fieldwork experience to highlight some of the interactions between research participants and researchers engaged in the process. We were interested in discovering the map drawing with our research participants in order to discuss different aspects of the maps rather than assuming them beforehand. Networks can be drawn using computer software which allow for homogeneity of representations, ease of navigation for spatial arrangement and rearrangement of nodes, and the possibility to build and manipulate layers of information. 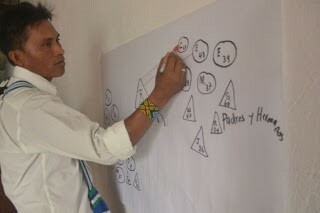 However, using computers was an obstacle for our participants, so we chose to work with hand drawn maps. Such a choice entailed a series of challenges and findings that we share here. During this and other research endeavors, we noticed various methods to which research participants were already accustomed: for instance, being asked questions and their answers being recorded in paper or audio formats, and being asked permission to take pictures or videos of them whilst they go about their everyday lives. With these and other methods however, the stages of design and analysis tend to be carried out elsewhere: back home in researchers’ rooms or offices, discussing with colleagues or poring over their notebooks or computers. As researchers, we take our time in formulating problems, carefully crafting and often piloting approaches before we throw ourselves into fieldwork. We also take considerable time in reflecting upon and analyzing the information being explained. This can also be the case in mapping social networks that are used primarily as a tool for the researcher to interpret and convey her research findings. Our research departs somewhat from this model. Our approach encouraged an active involvement of participants in the elucidation and visualization of their own worldviews, as well as fostering an ongoing, joint reflection about findings. The rationale for an approach that places the interaction of researchers and research participants into central focus can be traced back to various theoretical and ethical considerations. 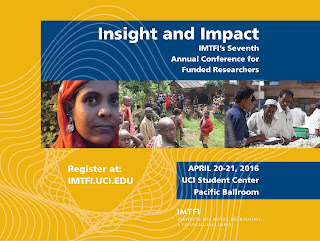 These include participatory action research approaches giving prominence to the collective construction of knowledge and highlighting the transformative aims of scholarship (Salazar, 1992; Fraser et.al, 2004) as well as an understanding of explanation as something that does not displace people’s experience (Smith, 1996). But this post is less about our research methodology’s underpinnings and more about their implications while mapping networks. For the first step of mapping the members of the network we conceived of a set of conventions: circles for females and triangles for males, double lines for marital unions and lines stemming from such unions conveying offspring. The circle/triangle differentiation was easily incorporated by research participants and perhaps showed how ingrained such distinctions are. It was the other aspects of the exercise that presented difficulties. For the first participant, we provided a sheet of paper (size A2) and colors for drawing her map. In this, some hurdles came up with handling spatial distribution: it so happened that either some members of the network ended up being cramped in a corner or just did not fit within the page even as a large part of the page remained blank. In response to this we changed our strategy which proved useful. We provided participants with a large piece of paper for practice so that they could get a feel of how the distribution could look like (see picture below). Other issues had less to do with practice and more to do with fitting the realities of their networks into the picture: if a widow remarries but keeps her connections with the family of her late husband, does she include both mothers-in-law? How does one distinguish between formal unions and those outside of marriage that have nonetheless produced offspring? What if a neighbor or friend, who is not part of the family, is actually quite important and ought to be included? We realized that the practice of encouraging participants to have another go and include the adaptations they saw fit was quite productive. One woman, for example, devised a convention to distinguish formal unions from informal ones or those that were no longer operating. She used a crisscrossed double line (similar to this: ₩₩₩ ) to include another woman her husband had lived with during a period in which they were separated and from which he had other sons, and she used it to include the father of one of her grandchildren who never assumed his responsibility. Others came up with diverse solutions: participant ‘A’ organized different types of relationships in different sections of the map (siblings in the bottom left, nieces and nephews in the bottom right, children in the upper left) to allow for her friends to have a space in the upper right, whilst participant ‘B’ drew her connections towards different family units that were themselves organized around the woman in each family (her mother, her late husband’s mother, and her current husband’s mother). Our lesson was that, on the one hand, it was important for the participants to have many attempts, as it gave them the chance to ‘polish’ their work between drafts, just as researchers do. Additionally, this allowed for the sequence of attempts to be used as a resource: why does an estranged husband appear in the second, but not first attempt? Why do some members appear in more central positions in one draft compared to another? Such questions ended up being engines for further discussion. Rather than impose a correct way of doing things, giving participants leeway to adapt allowed for a more creative and richer grasp of their own worldviews. Such adaptations allowed for differences among the maps, instead of the homogeneity of results one would get using a computer program for this procedure. We are, however, left with the question of whether these deviations stemming from reflections – as well as interactions between the researchers and participants- are to be located within the metric of the problem or as a resource in itself. This is a real question, for which we don’t have a set answer. If participant A in the example above aggregates types of relationships, whilst participant B focuses on family units organized in terms of couples and their offspring, this can affect both the sorts of flows being drawn and the interpretation of them. In the case of B one can see how a sibling with many children tends to receive more money than what he can give to others, and this is not something that would be as evident in A’s map. But insisting on the organization around family units could be an imposition on A, who may be telling another story: one in which personal relations with a nephew, for example, are not mediated by the sibling/parent but rely on the relation or affinities between the two specific individuals. Going back to the parallel with network-mapping computer software in which centrality is provided by the flows in the network, in our research the centrality of a node in the distribution was based on the person’s perception. Thus, while the drawing of flows could eventually challenge the initial centrality given to a node (´look how many things pass/ don’t pass through this person’), this was not something that could be resolved by means of a straightforward formula. And this was so because we wanted to map different sorts of flows, which do not necessarily have numerical equivalents. 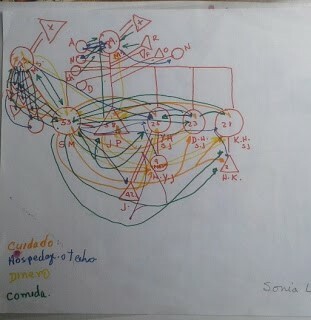 Let us move on to discuss, then, the second step of our mapping exercises: the drawing of flows. We began by ascribing different colors to the different sorts of goods and services flowing through the network: yellow for food, red for housing, green for money, dark blue for care and light blue for advice. To this we added an extra color (orange) to be used if the participant wanted to draw another flow that was not included in the ones we presented. Not all used it, but this extra provision turned out to be interesting. One participant chose to draw ‘union’ which for her denoted joint participation in festivities or everyday recreation and hanging out, while another drew ‘yahé’ — the traditional indigenous medicine through which he communicated and took care of his daughters. This signaled to us other sorts of interactions that pertained to wellbeing and a good life while highlighting that the components of such rituals and interactions were quite diverse. Arriving at the most relevant categories in research tends to be an exercise of fine tuning between two poles that can be equally unproductive: too much abstraction and too much complexity. Too much abstraction can empty the map of the sort of referents that are meaningful for a person, or enforce the invisibility of particular dimensions—which has happened often enough, particularly when discussing the activities carried out in the domestic sphere. That too much complexity can also be problematic was a lesson, which became all-too-evident for us in this second part of the exercise. The design issues we faced in the drawing of goods and services circulating through the network were, again, both a matter of operational convenience and flexibility. For while including different sorts of flows could give us a more comprehensive view of the interactions in the network, too many flows could make the resulting map unreadable. Even without the extra color, our maps ended up being quite saturated and difficult to read (see picture above). The interpretation of these maps began along with their crafting, and has not finished. We still have some work to do, including analyzing what these maps tell us about present views in the context of other fieldwork material we gathered about past and future perspectives of families’ social protection practices. 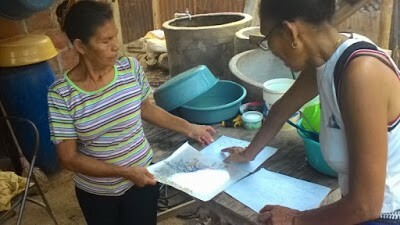 We want to emphasize that drawing their maps was something these participants enjoyed (and so did we). Some of the pros discussed here—of the different attempts and on-site conversations during the map-drawing becoming a resource—could also be obtained in other contexts using computer software. But one thing to be said about whatever means chosen is that networks can help visualize not only quantities of flows but entire worldviews. And for the latter, thinking about the best way of harnessing participants’ abilities is key for their engagement. Fraser, N., H. Dahl, P. Stolz and R. Willig (2004) ‘Recognition, redistribution and representation in capitalist global society: An interview with Nacy Fraser’, Acta Sociológica, Vol.47, No.4, pp.374-382. Salazar, M.C. (1992) (editor) La investigación-acción participativa. Inicios y Desarrollos. Editorial Popular: Madrid, pp.14-20. Smith, D. (1996) ‘Telling the truth after postmodernism’, Symbolic Interaction, 19, pp.171-202. What are "informal" currencies? How do people transact using both formal and informal currencies? What economic and social calculations do these financial practices entail, for women in particular? For more, read Magdalena Villarreal and Lya Niño new article in Human Organization, "Financial Practices on the Borderlands (la línea) in times of Crisis" based on their IMTFI-funded research on women who frequently travel back and forth between two border cities in Mexico and the United States! Financial practices are not only about money. This paper discusses how people living and working in the Mexico/United States borderlands weave their economic lives by combining, associating, and disassociating formal and “informal” currencies. We base our analysis on transactions carried out by women who commute regularly between the twin cities of Mexicali and Calexico, detailing their financial practices; the frameworks of calculation they employ; and the social, cultural, and financial mechanisms they and their families use to cope with their daily lives. These include the use of monetary and non-monetary calculations and resources, different types of indebtedness and forms of reciprocity. Such findings reveal mistakes in the tenets upon which much anti-poverty and financial aid programs are based. A focus on people's use of particular calculations, resources, and social relations will help substantiate better alternatives that can be implemented in supporting their economies. Related blogpost for this research "Juggling Currencies in Trans-Border Contexts (Intro)"
"Juggling Currencies Across Borders (Mexico/US): An Ethnographic Film"
Some say that the end of cash is in sight because we’re all going digital. Conducting financial transactions with cash has some perks like ease of use. However, it is also associated with problems and handling costs (see for example David Wolman's The End of Money). 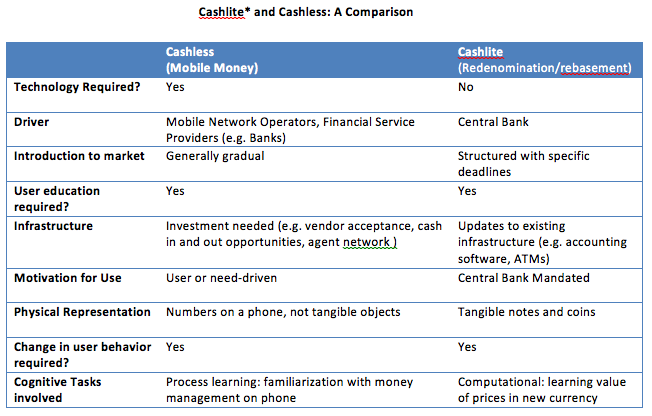 Therefore, going cashless – or cashlite - makes sense. In this blog on our research in Zambia, we focus on the form of cashlite-ness in which there is a transition to a more portable form of cash. Going cash-lite by introducing new cash denominations made sense in Zambia, which experienced inflation rates as high as 188% during the 1900s and early 2000s. Going cashlite can alleviate some of the problems associated with cash. 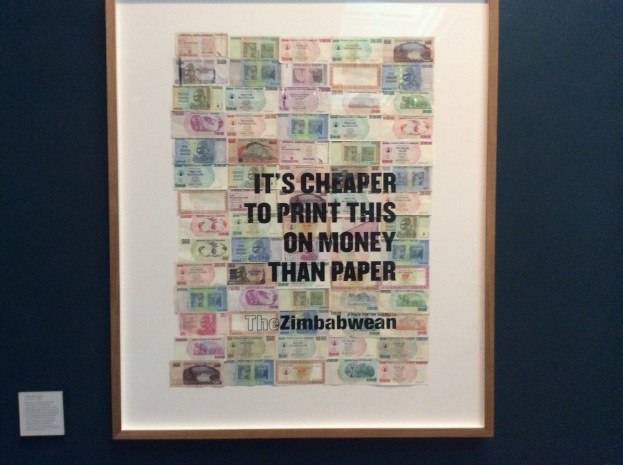 This is especially true in countries (especially in developing economies) burdened with large volumes of low-value currency notes because of high rates of inflation. Transitions to a lower volume of cash can occur when people favor other forms of payment over cash. But another way to reduce the volume (and costliness) of cash transactions is when states introduce a new, higher value legal tender (currency), here referred to as “Cash2.0.” When higher value denomination notes are introduced, the volume of cash being handled decreases, while the value remains unchanged. This improves efficiency, and reduces costs and hassles. Switching to Cash2.0 means switching to a lighter (less bulky) form of cash. In Zambia, high rates of inflation led to a number of difficulties with accounting and bookkeeping, keeping statistical records, and data processing software. The need for consumers to carry large amounts of cash created higher risks and inconvenience. It also increased the costs for technology and maintenance of banking and payment systems. Since going cashless and cashlite (via a currency change) both make sense, what happens when both of these are introduced to citizens of a country around the same time? Would the introduction of a more convenient form of cash make people less interested in cashlessness? Or, could the transition to cash-lite spur an interest in going even lighter, eliminating interest in the use of notes and coins altogether? To explore this idea, we examined people’s preferences for and experiences with the new currency and mobile money in Lusaka, Zambia shortly after the new Kwacha was introduced. Fieldwork was conducted for five to seven months following the rebasement. We asked individuals about their experiences, knowledge and use of the new currency and mobile money. Vendors were asked whether they accepted Mobile Money as a form of payment. The new notes were perceived as easier to use than their predecessors. Unlike in other countries (e.g. Ghana’s redenomination in 2008, people experienced minimal confusion when encountering the new notes. Some interviewees suggested this had to do with the font and form of the cash value printed on the old Kwacha note. Instead of 10,000, the value was represented as “10000” with the last three zeros in smaller font than the rest of the value of the note. As such, our interviewees argued they were already used to ignoring the three zeros at the end of the currency, which were dropped in the rebasement. Similarly, the three zeros at the end of the currency were ignored in the local nickname for the old currency. In local parlance, 1000 old kwacha was referred to as 1 “pin,” 10,000 as 10 pin, etc. presumably because a bundle of low value notes were kept and “pinned” in sets of a 1,000 to keep track of large volumes of Kwacha notes. In this sense, there had already been a culturally driven rebasement of sorts in local representations of the old currency preceding the actual rebasement. 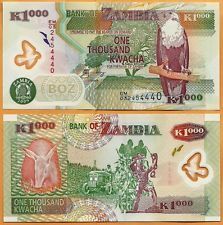 In essence, the three zeros of the old Kwacha were being discounted long before the rebasement made this official. An additional factor leading to the ease of transition which one bank official noted was the fact that it was three zeros that were dropped during the rebasement, which differed from all other previous old to new currency conversion rates. 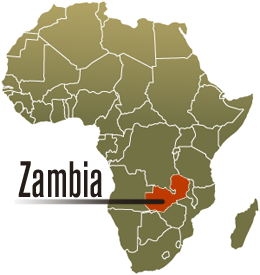 The rebasement included the re-introduction of coins to Zambia, which previously had limited use due to inflation. 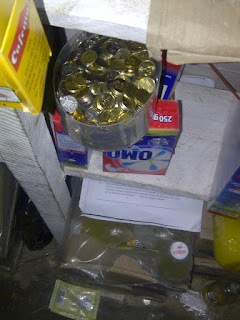 The general consensus was that while the notes were convenient to use and keep on one’s person, the coins were less so. A typical strategy people adopted to deal with coins was saving them for a rainy day. An alternative was to gradually learn or remember how to incorporate them into daily use. More than half of our sample did not use mobile money (MM) in the initial period following the currency rebasement. Our sample’s MM users – who used the product mostly to send remittances - did not report a change in MM use post-rebasement. Unclear distinctions between online banking and mobile money for banked consumers. At the time of data collection, most groceries and other consumer items that the average Lusakan purchased on a daily basis could not be paid for using Mobile Money. Apart from bill pay, only 2 of the 50 retailers sampled in malls, and none of the 100 retailers in markets sampled, accepted mobile money as a form of payment. 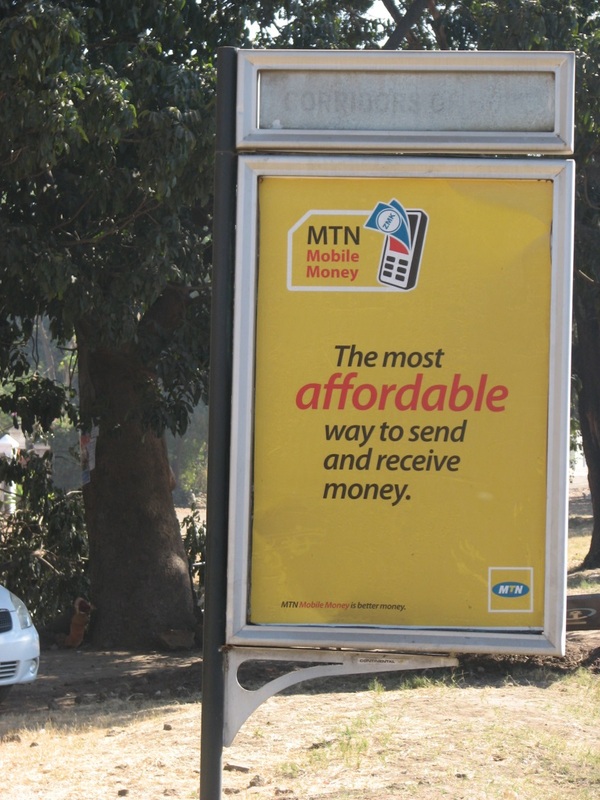 However, some retailers mentioned that they were considering mobile money as a payment option in the future. Customers who paid with Mobile Money got a free movie ticket. In the years since our fieldwork was conducted, mobile money has been marketed aggressively in Zambia. For instance, the company Zoona (http://www.ilovezoona.com/), interestingly a non Mobile Network Operator (MNO), has become a major player in Zambia’s mobile financial service marketplace. The harder Zoona and other Mobile Money providers work to enlarge the Mobile Money ecosystem beyond remittances and bill pay, the more likely it will be for the average Lusakan consumer to find themselves needing to choose between cashless and cashlite payment options. For now, the answer will be more retailer than consumer driven.